This is the third post in the Cancun series. Most tourists who vacation at resorts or hotels in the Caribbean or in Mexico, I suspect, would end up eating breakfast at their hotel’s restaurants because of the all-inclusive stay option available at many resorts. We often avoid all-inclusive hotels, primarily because of the poor quality of food served at these restaurants (this comes from one inadvertent experience in the Caribbean, when we chose all-inclusive not knowing what it meant and have since never forgotten the meaning of all-inclusive and the experience). The hotel that we stayed at in Cancun had a good spread for breakfast, and also charged more than an arm and a leg for it. While breakfast was served until noon, the wait to find a table was usually about a half hour. Now, when we want to eat breakfast, we want to eat it right when we want it. We were just fortunate that there was a Starbucks Coffee outlet within a few minutes walking distance from the hotel. On the first day that we were waiting for our table to be ready, we went to Starbucks to grab a coffee / tea. We were pleasantly surprised that the Starbucks Coffee outlet served bagels (toasted upon request), oatmeal, and sandwiches for breakfast. There were a couple of vegetarian sandwiches, but I do not remember what those were. There was no paper menu available that I could use as reference for this post, and so, I was about to take a photo of the sandwiches listed, when the guy at the counter, told me sternly in Spanish, that I cannot take any pictures. Is Starbucks worried about competition from another chain that they forbid photographs of their food? Or is it just plain weird or rude to take pictures of food outside the US? Back to the topic of this post. 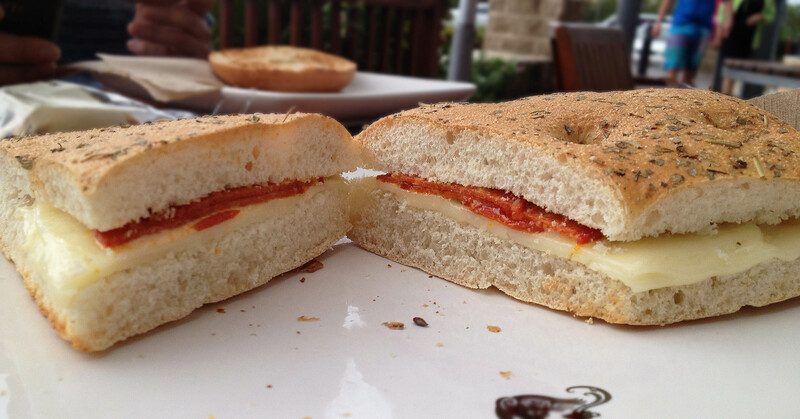 Our typical breakfast for the day was: a plain bagel toasted with cream cheese on the side, and toasted sandwich of herbed focaccia bread filled with Spanish chorizo and Manchego cheese. The bagel was well just a plain bagel. Nothing close to the bagels listed in this post of mine about my favorite bagel in NYC. Regular readers of this blog will know that I am partial to cured meat. So, I just loved this sandwich – the chorizo was a bright red, and mildly spicy, perfectly accompanied by the warm, slightly melted, and somewhat gooey, Manchego cheese. The herbed focaccia bread was crispy on the outside, soft, airy, and slightly chewy on the inside. Both were tasty and perfect for breakfast, so much so, that we had the same two things every day for breakfast even when we knew that there were other options. There is something strangely comforting (boring as it may sound) about eating the same tried and tested dish for the first meal of the day, wouldn’t you agree? More Cancun posts to follow….